The Zeiss Conquest Gavia 85 Spotting Scopes have an 85mm angled body and 30-60x zoom eyepiece. The Gavia 85 is designed for anyone viewing nature in its many forms. 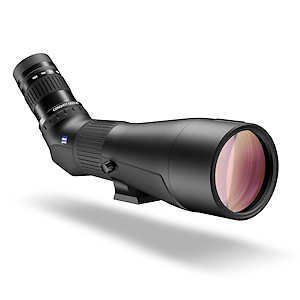 At 60 ounces complete, the scope is very light for its size thanks to a magnesium alloy housing. The Conquest Gavia 85 features a close focus distance of 10.8 ft, making it great for songbirds and insects like butterflies and dragonflies. The Zeiss Conquest Gavia 85 features a tripod mount base that will fit some Manfrotto tripod heads directly, and include the standard tripod screw mount hole for other tripods. Available accessories include ExoLens Bracket phone adapters for select Apple and Samsung smartphones, an Astro adapter for astronomical eyepieces, and more. Field of View: 99 - 69 ft. at 1000 yds. Product Weight (oz): 60 oz. Zeiss offers a Limited Lifetime Transferable Warranty which protects you against defects in workmanship or materials for the life of the Product. If a defect that is covered by this Warranty is found, Carl Zeiss will, at its option and without charge, either repair your Product or replace it with a Carl Zeiss product of comparable specifications and value. Zeiss Lens Care Kit 2oz.